Claudio Parmiggiani began his Delocazione series (which translates to “delocation”) in 1970. Using soot, ash, and smoke, Parmiggiani makes images magically appear out of seemingly nothing. The recognizable objects that once masked the surface are absent except for a ghost of their form left on the board or wall. This technique is most startlingly used to great effect in his series of bookshelves filled with volumes, the actual objects missing but the shadows of the library recorded on the gallery walls. Here, a more fleeting subject than books leaves its mark. 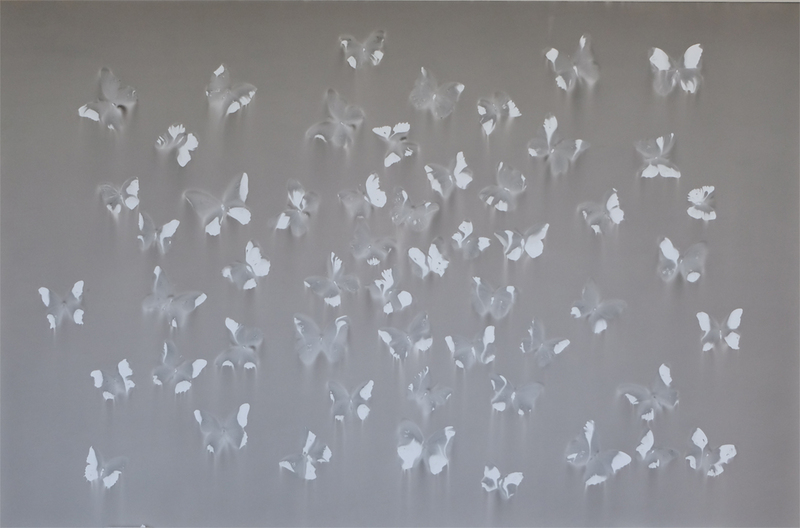 The outlines of butterflies fill the image of this untitled work, with their wings seeming to flutter out of a fog towards the viewer. The finished work is delicate and elusive, like the butterflies themselves. Born in Luzzara, Italy, in 1943, Parmiggiani lives and works in Parma. His work has been included in exhibitions across the US and Europe, and is held by both public and private collections worldwide.